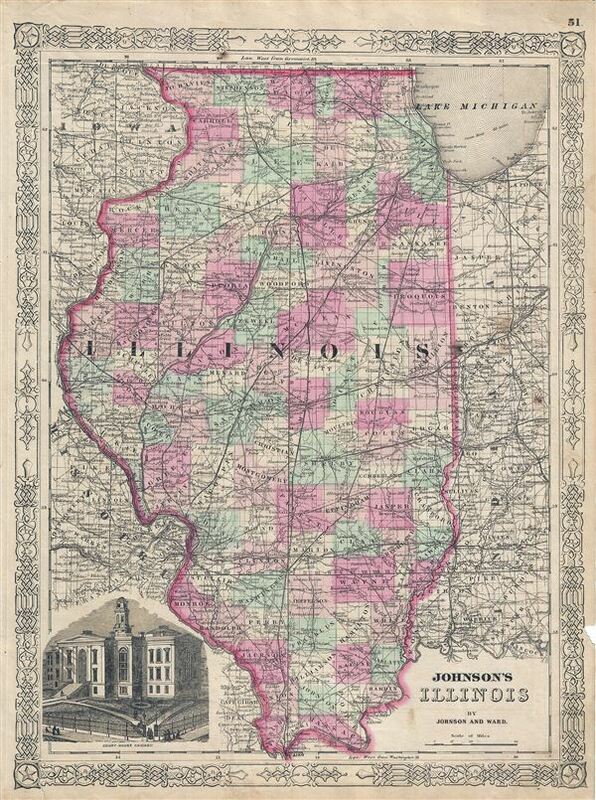 This is Johnson and Ward's 1863 map of Illinois. This map shows cities, topographical features, railways, ferries and roads with color coding at the county level. Covers the entire state as well as portions of the adjacent states of Iowa, Missouri and Indiana. Offers color coding according to county and notations for railways, roadways, cities, towns, and river systems. An inset in the lower left corner details the Chicago courthouse. Features the fretwork style border common to Johnson's atlas work from 1863 to 1869. Published by Johnson and Ward as plate no. 51 in the scarce 1863 edition of Johnson's Family Atlas. Very good. Minor spotting at places. Text on verso. Minor verso repair near bottom margin. Minor damage over right margin, not extending over printed area.